The Douglas-Hart Nature Center is located at 2204 DeWitt Avenue East, the corner of Lerna Road and DeWitt Avenue. 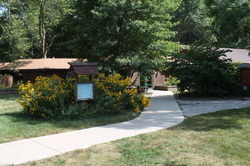 The Douglas-Hart Nature Center consists of 65 acres of native Illinois habitat including prairie, woodland, and wetland. The center includes a visitor center with several amenities. The nature center is open Monday - Friday 8am-4pm, Saturday 10am-4pm, and Sundays from 1-4pm. Trails are open daily, sunrise to sunset. The best place to start is our visitor center. Learn about our current land management projects. Unique and special features from gardens to plants. A map to our trails with special landmarks. Not sure what to do while visiting? This page will help! Footage is courtesy of Brandon Gillespie, 2015.